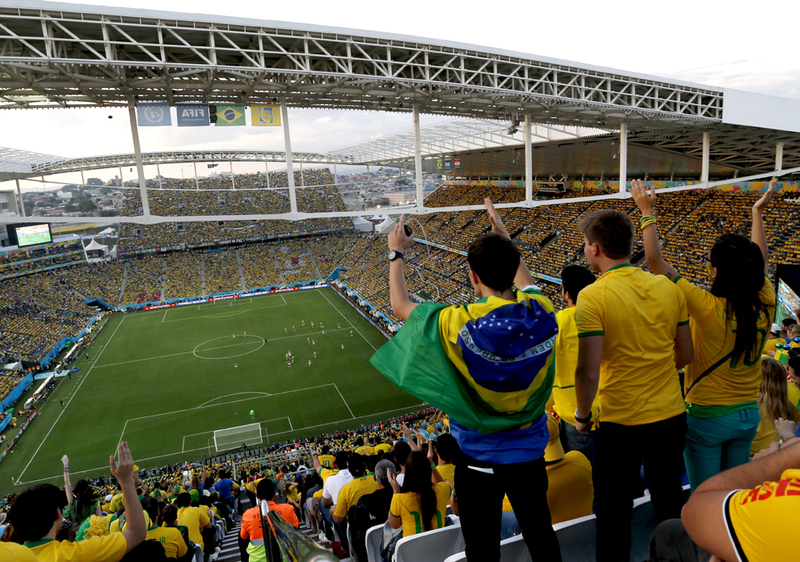 Chile race into a two-goal lead before Cahill reduces the arrears for Australia. Official having a nightmare in Mexico Cameroon game, disallowing two legitimate goals. Chile seal the win in injury time when Jean Beausejour collects a loose ball and hammers into the corner from 20 yards. There are chances at either end with Cahill and Mark Bresciano going close for Austrlia, but the best one falls to Chile after Alexis Sanchez picks out Eduardo Vargas who beats the keeper with a delicate chip, but sees his shot scrambled off the line by Alex Wilkinson. The thousands of Socceroos fans in the stadium have finally got something to cheer about as Tim Cahill produces one of his trademark headers to bring Australia back into the game. This is too easy. Alexis Sanchez picks out the unmarked Jorge Valdivia on the corner of the area and he curls in a beauty from 18 yards. This could be a very long night for Australia. Australia fail to clear and goalkeeper Mat Ryan is caught napping and when the ball falls to Alexis Sanchez he steers home from the edge of the six-yard box. There’s a sense of disbelief in Spain after that result. Er.. Did that just really happen?! Wow. What are your thought on that game now the dust has settled? Does Del Bosque need wholesale changes? But one man is staying calm. That man is coach Vicente Del Bosque, who says he will have to find a solution to Spain’s problems. “There is no need for a revolution. We did not win but we will move on and try to win the next game. 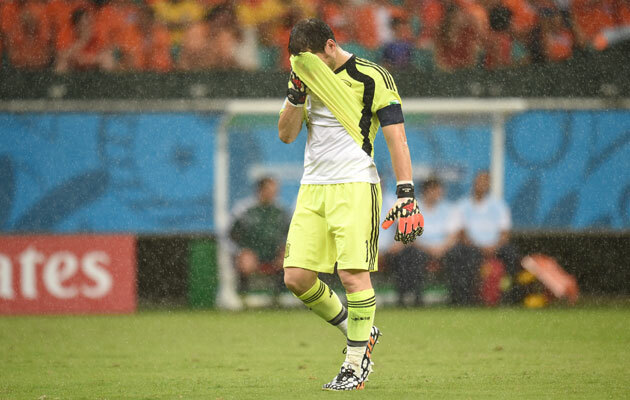 That is a real howler from Casillas. He’s far too casual receiving a back pass and Robin van Persie tackles him before sliding the loose ball into the vacant net. Although Spain lost their opener four years ago, this result has an end of an era feel to it. David Silva thinks he has reduced the arrears when he pokes in from a yard out but the flag is up for offside. 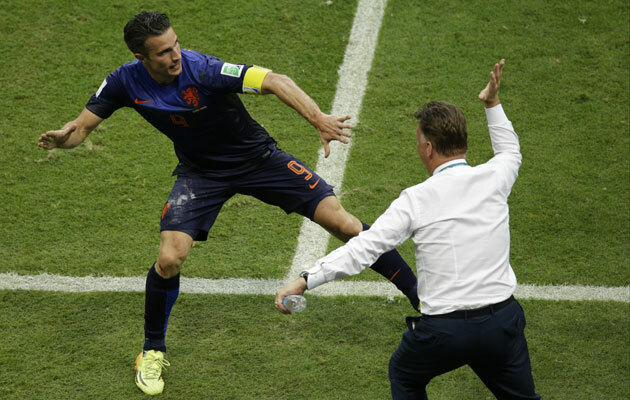 Van Persie’s miss is not costly because within three minutes Holland have scored a third. A free-kick is swung over by Sneijder and it reaches de Vrij at the far post who bundles the ball in from close range. Casillas appeals for a foul by Van Persie, and he may have a case, but the goal is given. Arjen Robben surges towards the Spanish penalty area and lays the ball off to Sneijder, who tees up Van Persie and the striker smashes a volley against the crossbar. Another long crossfield pass is the undoing of Spain. This time Robben collects and cuts inside Gerard Piquet before beating Casillas with a deflected left foot shot. 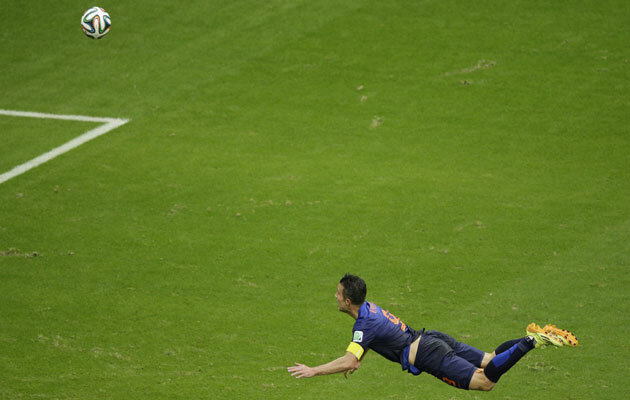 Robin Van Persie scores with a wonderful diving header. Wow! What a goal that was. Blind sends a long raking crossfield pass towards the penalty area where the onrushing Robin Van Persie connects with a wonderful diving header. How expensive will that David Silva miss be? Iniesta plays a wonderful blind pass to David Silva eho tries to be too cute and chips the keeper who does well to parry the ball away for a corner. Xabi Alsono steps up and slots the ball past Dutch keeper Jasper Cillessen. Xavi and Andres Iniesta combine to set up Diego Costa, who cuts inside Stefan de Vrij, but the defender clips the forward with his trailing leg. The referee points straight to the spot. The first chance of the game falls to Holland and it’s a good one too. Arjen Robben is the provider, slotting a perfectly weighted pass through to Wesley Sneijder but the Dutch playmaker shoots tamely at Casillas. It was reminiscent of Robben’s miss in the final four years again, though this time he supplied the chance and Sneijder fluffed it. Just as in Johannesburg, it should have been 1-0 to Holland. It’s been coming and Mexico finally get their reward for a sustained spell of pressure. A flowing one-touch move reaches Giovani dos Santos and although his initial effort is blocked by Charles Itandje, the ball falls kindly to Oribe Peralto who rolls it into the empty net. FIFA has provisionally banned German legend Franz Beckenbauer from all footballing activities for 90 days for failing to co-operate with the Qatar 2022 corruption inquiry. Beckenbauer, who won the World Cup with West Germany as a player and as a coach, had been asked to assist with a FIFA ethics investigation into the decision to award the World Cup hosting rights to Russia in 2018 and Qatar in 2022. He left FIFA’s executive committee in 2011. Just to give you an idea of the conditions in Natal, this is the scene from the stadium. Could this have been a factor in those two contentious offside decisions? Visibility is not exactly ideal. 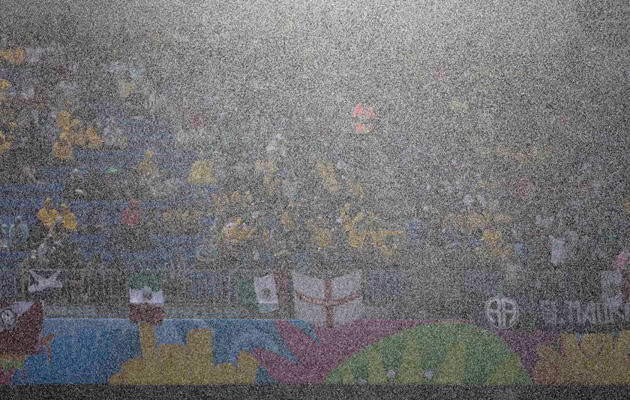 Visibility impaired… rain pours down during Mexico’s match with Cameroon. 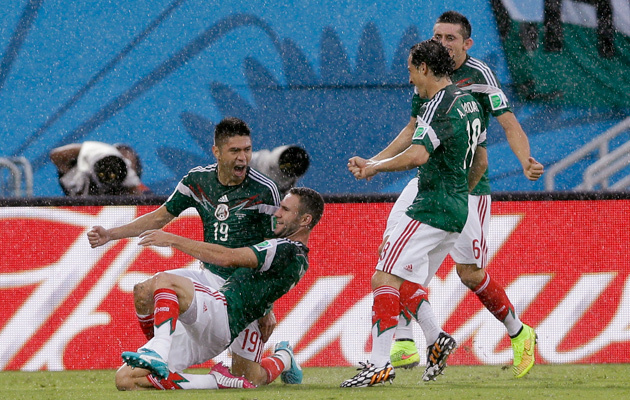 It’s goalless at the break, although Mexico will rightly feel they should be two goals up. The rain continues to pour down and as the players and match officials trudge off, they will welcome the sanctuary of the dressing room. It’s a chance to dry down, regather ones thoughts and for one particular official, an opportunity to reacquaint himself with the offside law. There may have been a suspicion of offside about the first disallowed goal, but not this effort from Giovani Dos Santos. A corner is swung in and glances off the head of a Cameroon defender and lands with Giovani Dos Santos who heads in from close range. The twitchy Colombia official again raises his flag and the goal is ruled out. The Mexican players are under understandably livid. Since that let-off Cameroon have been the better side and after a surging run by Benoit Assou-Ekotu, Samuel Eto’o comes close to breaking the deadlock with a left foot shot that hits the post. No goals so far but no shortage of chances in what is an open game played in torrential rain. Mexico think they take the lead, only for the effort to be ruled out for offside. Hector Herrara plays in a perfect cross from the right and Giovani Dos Santos volleys home. He’s level with the last defender, but the referee’s assistant flags for offside. Let’s hope this is not one of those tournaments that will be remembered for the poor decisions made by the match officials.